FlairStrip, an unknown Indian ISP that had suddenly surfaced made Indian netizens skip a heartbeat with their internet plans. It was kind of dream come true for them. Here is what FlairStrip was purportedly offering. Broadband speeds of 48mbps, that too unlimited without any FUP and that too at a price of Rs. 479 per month. But it all came out to be a big April Fools prank! People managed to guess it because Flair Strip was basically a anagram of April First. Everyone started talking about it in forums, and finally the creators had to give up that it was a April Fool prank. A few minutes back they published an update acknowledging the same. Here is the update they offered to people, as the hopes were getting too high! As many of you have already guessed, Flairstrip isn’t real. At its worst it is a too-good-to-be-true promise, at its best it is wishful thinking. The latter is actually why we decided to do this. Because every day we wish for something like Flairstrip to exist. 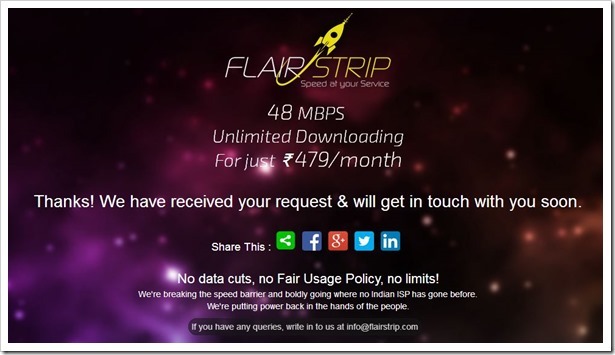 Flairstrip isn’t breaking the speed barrier and boldly going where no Indian ISP has gone before. Flairstrip isn’t putting power back in the hands of the people. But maybe we, collectively, can. Within 3 hours of getting the word out, Flairstrip got over 3000 requests for early invites, 250+ Twitter followers, and also got mentioned in a few online publications of note. An admittedly tame prank like Flairstrip can get so many excited and talking, and dare we say it, hopeful, then maybe it’s something to be asked of our regulators and service providers. We can demand for it, pay for it, and achieve parity with our peers across the globe, maybe even set a few standards here or there. An internet with no data restrictions, no FUP, and no limits isn’t unreasonable. We would all like that to happen. We’re genuinely sorry for getting so many people’s hopes high over nothing. Our intent was to draw attention to the absence of a service even remotely close to Flairstrip, not get cheap laughs. We know it wasn’t the cleverest prank (it didn’t even survive for more than a few hours so the joke’s kind of on us!). And we know that like us, many of you don’t need reminding of what’s absent and what could be. But we did it anyway. Our ruse of Flairstrip (a schoolboy anagram of ‘April First’ as people have obviously figured out) ends here and now. We hope we didn’t ruffle too many feathers, but just enough. I have to concede that it was good April Fool prank, even though bubble burst far too prematurely! So, do you have any plans for April Fool Day?